Released in the same year, this game was set to rival the then brand new and innovative Colin Mcrae Rally - and it failed. It simply paled to raise interest in the style of Colin Mcrae Rally, instead coming out as a standard rally game with lousy collision detection. Notably, it also contains many duplicate cars from Colin Mcrae, since it was released in the same year. Apologies for the shots , but the game contained no replays. 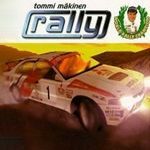 Was Tommi Mäkinen another rally driver?